Strawberry Parfait is an early season variety with red-splashed flesh "like strawberries in vanilla ice cream". Fruit is striped red over ivory skin. Flesh is soft and doesn't keep well. On a warm day, and if the fruit is a little overripe, you can get a distinct scent of strawberries as you pass by the tree. Previously grown as NJ 46. I wonder if this might be the variety I know as Strawberry Banana? If yes, there are a few growing outside of Chilliwack, British Columbia. 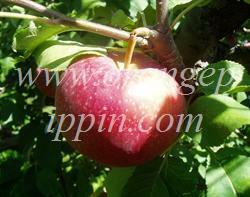 Amazingly tasty and fragrant apple. I believe this is the apple my mom used to call a strawberry apple, very old tree at the time, just found an old tree that may be this variety in Greenville, ME.